The Living Room in the Key West House prior to the renovations for the filming of the series. 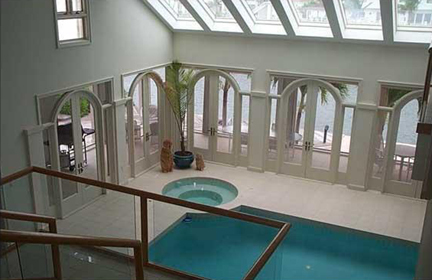 "The first floor foyer opens up into this vaulted ceiling room overlooking open water views. The centerpiece of the house is the 12 by 20 foot indoor pool and spa. Off of this room is the open kitchen and bar, a formal dining room, living room and the den." In comparison with the picture above, the Living Room during the filming of the series. Major renovations to the Living Room included the addition of the sunken lounge inside the drained pool. 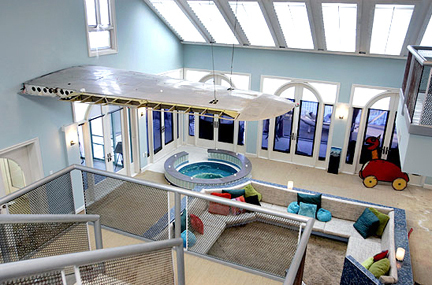 Glass blocks and tiles were added around the edge of the Spa and an airplane wing was hung from the wall and ceiling. The glass panels on the Stairs were replaced with metal screens.